Compare a patient’s self-reported eye symptoms to their electronic medical record, and clear discrepancies can be seen. 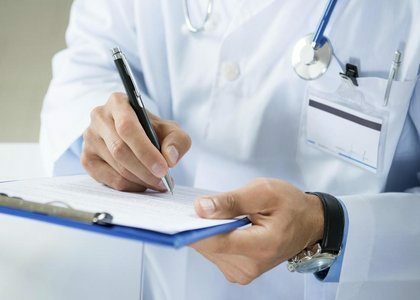 A study from the University of Michigan Kellogg Eye Center revealed wide disparities in the content of pre-appointment patient questionnaires and what a clinician wrote down to document the visit. The study, published Jan. 26 in JAMA Ophthalmology, analyzed the symptoms of 162 Kellogg patients. Each completed a 10-point survey while waiting to see a physician; questions came from sources including the National Institutes of Health Toolbox. The doctors treating these patients weren’t told about the surveys, or that their record-keeping would be reviewed for comparison. The contrast was stark: Of the study’s group, “exact agreement” between an individual’s survey and what appeared on their medical record occurred in only 38 patients. Symptom reporting drove the inconsistencies between surveys and medical records, the study found. The top discordant issue: glare. Of patients reporting concern about glare on their surveys, 91 percent didn’t have it on their medical record. Eye redness was second-most common (80 percent had no medical record mention), followed by eye pain (74.4 percent). Blurry vision was only the symptom to tilt the scales with more instances of inclusion in medical records than in questionnaires. As a result, other doctors treating the same patient in future visits could have an incomplete picture of their symptoms. Perhaps more risky: Because digital medical records are increasingly used to guide clinical practice or research, the collective data may be shortsighted or misleading in some scenarios, Woodward says. “Many parties in health care use the electronic health records now and they expect the data to accurately reflect the interaction with the doctor,” says Woodward, also a member of the Institute for Healthcare Policy and Innovation. Explanations for the medical record-doctor-patient disconnect are understandable, she adds, with neither party at fault. The doctor-patient relationship is more nuanced than what is reflected in the medical record. A patient might not choose to mention all of their symptoms. Doctor dialogue may follow a conversational path versus a point-by-point checklist. Time constraints of record keeping in the electronic chart can also be an issue. And not every detail of a given appointment particularly minor concerns is necessarily worth documenting. The study highlights an opportunity to improve lines of communication between patients and doctors. For example, implementing pre-appointment eye symptom questionnaires similar to those in the study could simple and effective, Woodward says. A similar pilot program, she notes, is underway in her clinic. “This is definitely a pathway I see as very feasible to resolving this disconnect in the near future; the infrastructure is already there,” she says. The concept also could help bring more clarity to what ends up on a patient’s medical record. Because the surveys Woodward and her team used asked participants to assess their conditions’ severity on a numeric scale, results could help practitioners better evaluate the depth of a patient’s symptoms and even identify concerns that might have gone unnoticed. The use of a self-report system before seeing the doctor could “really change the conversation between the doctor and the patient,” says Woodward. Rather than spending time to identify symptoms, doctors and patient could be talking about how to manage severe symptoms.